Well, it’s over. 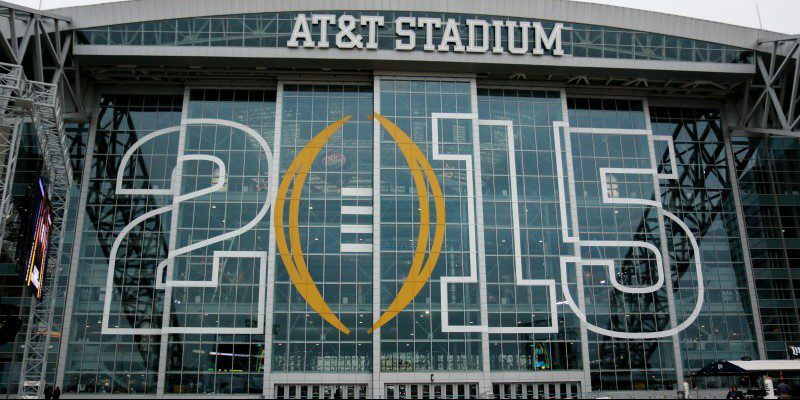 College football came to an end last night; the Ducks lost 42-20 to Ohio State in the national championship. I’m sad, and you’re probably sad, because losses are hard to take, especially when you lose the last game of the season. But, things will be okay. I promise. The Ducks came out and looked good right off the bat. Marcus Mariota drove the offense down the field and scored a touchdown to take a 7-0 lead – but that was about as sharp as we looked all game. I’ll say this right now, Ohio State had the Oregon offense figured out. How do you stop an avalanche? You don’t let it get started. And, that’s what happened last night. 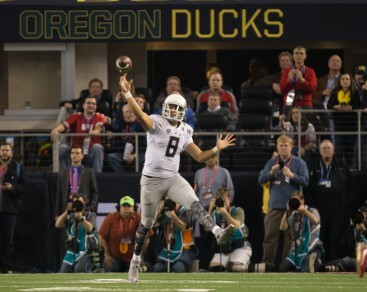 Marcus Mariota and the Ducks never got their offense rolling. I don’t want to say that the two drops on third down killed the Ducks… but that might be the case. We could have had a 14-0 lead, and with the way the defense was playing we could have taken Ohio State out of their game plan early and put more pressure on Cardale Jones to beat us. The drops by Charles Nelson and Dwayne Stanford took the Ducks offense off the field and gave the ball back to the Buckeyes. Here is a stat for you: the Ducks punted three times in the first quarter – the most since 2009. That’s not Duck football. The Duck defense tried, but they couldn’t contain Ezekiel Elliot. On offense, the Buckeyes ran their counter play over and over again and Ezekiel Elliot was a beast. The Ohio State running back ran 36 times for 246 yards and four touchdowns, earning MVP honors for the game. In contrast, Oregon as a team ran 33 times for 131 yards and 0 touchdowns… sigh. Our defense played its “bend but don’t break” style effectively. We got the turnovers we needed, but we couldn’t capitalize offensively. The Ducks went 2-12 on third down in the game, which is a recipe for disaster. Oregon didn’t make the plays needed to win, and Ohio State did. I hate to say it, I really do, but we were out-muscled last night. What hurts the most is that Oregon will be labeled “soft” once again; it’s going to happen. Chip Kelly said after the 2010 national championship loss, “We’ll be back,” and we got back. Now, only time will tell if/when we get back again. This team is loaded with young talent and more is coming in recruiting. We will be back sooner rather than later, and I truly believe that. The loss hurts. Scoring 39 points in two national championship games hurts. Getting labeled as “finesse” again hurts. However, it’s time to get back to work now. We went 13-2 this year. We won the Pac-12 title, had a Heisman winner, won the Rose Bowl and played in the national title game. It was a spectacular season! The future is bright for Oregon. As always, Go Ducks.